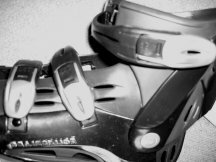 How To Choose A Pair Of Skates - What Do I Buy? 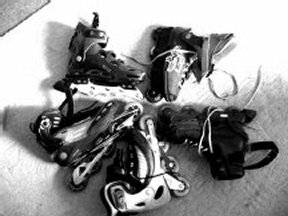 Choosing an inline skate can be confusing and frustrating for a new skater. The two most important things you need to consider before purchasing new skates are comfort and support. If the skate does not fit you comfortably then you won't wear it. If it doesn't support you properly, you could become injured or have problems skating. Take time when selecting you new skates. I tell people to plan to spend an afternoon in the skate shop trying on skates. Once you have gone through your check list of important items, you need to put the skates on and stand or wander the store (carefully) in them for at least a half hour. If after a half hour your feet still feel cozy inside, there are no sore spots, pinching or poky things bothering your feet, you're probably good to go. Next is the confusing part, what brand to I buy? What is the difference between brands and styles? Often you can answer these questions by taking a look at your goals as a skater. Are you wanting to buy skates for fitness purposes? Are you interested in playing inline hockey? Are you a new skater or do you have years of experience on skates? If you are an experienced skater you probably know exactly what you want in a skate, if you are new to skating it becomes more difficult to determine your goal. Search online and learn about skates, Find a Inline Skate shop in your area and talk to a knowledgeable sales person. If there is a shop that rents skates and gear, you are in luck. Rent several different pairs, gear up and find an area to roll around and get the feel of them. If you're new to skating, be sure to ask the shop about lessons. Many certified skate instructors also have skates that you can use during lessons. Contact an instructor in your area and take a lesson, and/or rent skates from them. Certified Instructors are a great resource and can help guide you in selecting a pair of inline skates. OK, Something is not right here, my feet hurt when I skate! How to Avoid, and Treat Blisters. There are the most common types of inline skates that you can purchase. Unless you are an experienced skater and know exactly what you want, you probably should opt for a recreational skate. Recreational skates can be used for many purposes and you aren't stuck with a specialty skate if you end up not liking them. Hockey - These are very similar to ice-hockey skates. They are made of leather and have laces so the user can adjust their fit. The wheels are for very quick turns and stops that are required in hockey. Speed - Inline skates for racing have five wheels, a longer skate frame, and have a low profile leather boot. Usually there is no brake. Speed skates are specifically used for racing, and experienced fitness skaters. Recreational - Have either a hard plastic shell boot which offers great ankle support, and more common now are the soft boot, made of durable fabric that offers a more comfortable feel. They come with a skate brake and standard wheels and bearings. Fitness - There are very similar to the recreational skates, But are made of lighter material and have a lower profile boot. Wheels often have a bigger diameter and are used for cross-training, such as skate-to-ski. Aggressive - These skates are made for use in skate parks on ramps and rails. They have much smaller wheels, grind plates, and are for use in extreme conditions. The job of the boot is to support the foot and ankle. This support is important, your ankle needs to be held firmly in place to avoid injury and fatigue as well as facilitate basic skills while skating. Hard Shell: Not as many skates are made with a hard plastic shell anymore, Which is unfortunate. The hard boot offers your best ankle support and will last longer. They are also much easier and quicker to gear up. If you are a larger stature person, or have weak ankles or previous ankle injury, you should invest in a hard shell boot. Soft Shell: Manufacturers have found that a soft boot is more comfortable and sells better to new skaters. While comfort is important it is equally important to be sure that the boot offers the necessary support. Over time the fabric can start to give in the ankle area, offering less and less support. Although, great strides have been made in fabrics that are more durable then some of the first models of soft shell boots. If you are more petite or slight of stature and have good strong ankles, you will do fine in a soft shell boot. Boot Liner: When purchasing a new pair of skates, you should pull the liner out and try it on your foot first. Be sure your foot fits comfortably yet securely into the liner. Put the liner back in the shell and then try the skate on again to be sure that the shell and liner together are comfortable yet supportive. Some liners are better quality then others, usually more expensive skates offer moisture absorbing material that help your foot breath better in the shell. The boot liner is removable and you can take them out and wash them. It is suggested that you enclose them in a pillow case when washing them. Foot Beds: Inside the liner you will find a removable foot bed. This can also be washed in a pillow case. You can also replace the foot bed with custom orthotics, moldable foot beds that have been made for your feet, or ones made of more supportive material that you can purchase at a store. Changing out the foot bed normally shouldn't effect the fit of the skate. Since the foot bed is offering correct support of the foot it should actually cradle the foot for a better fit. 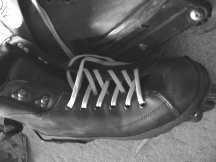 Laces: Laces are more common on hockey skates, dance skates and racing boots. You can adjust laces to a more custom fit , but they loosen up as you skate and don't offer the support that buckles do. They also take longer to put on because you have to find the right tension each time you put them on. Buckles: Buckles are permanently attached to the skate, and can be adjusted by a sliding mechanism and also by positioning options of the buckle. You can play with the different positions to find the most comfortable fit for your foot. The nice thing about buckles is, once you find the right combination they are usually in the right position every time you skate. 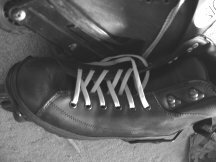 Laces and Buckles: A combination of the two can be found in some recreational and fitness skates. Usually the buckle or a Velcro strap surrounds the ankle area for support and the laces are adjusted over the top of the foot. These can also take more time, you need to adjust to the most comfortable and supportive fit of your foot each time you gear up. Sizing: Feet tend to swell slightly over the course of the day, so try boots on in the afternoon or evening when your feet are at their largest. 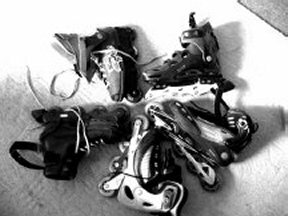 Skates are not like shoes; over time the liners will compact or form to your foot, depending on the material. Soft boots can stretch over time as well. You are looking for a perfect fit initially the boots should seem snug, because the liner will compress a quarter-to half-size over time. Your foot should feel casted within the boot. No side to side movement, or forward to back. Your toes should brush the end of the boots, but not crammed or turned under and you should be able to wriggle your toes. You don't want any "sloppy" feel of your foot in the boot. There should be no pinching, pressure points or pain. When trying on boots, wear the same socks you wear when skating. Cotton will absorb moisture, and this dampness can make your feet sweaty. Wear thin, synthetic or wool blend, over-the-calf socks. Socks that are too thick will take up too much space in your boots and interfere with a proper fit. Walk around and stand in the boots for at least 30 minutes to see how they feel. A person's feet can be two different sizes, making it even more difficult to get the right fit, and it may take several times to get the correct adjustment. When trying on skates remember; every manufacturer makes their skates to their own specifications. Sizes will vary from brand to brand and sometimes within brands. Skate are sized according to the mondo point system, This is the length, in centimeters, of the inside of the inner boot. If you ski, your mondo point for your inline skate should be the same size. If you have a wide foot, try going up a size or try a men's size if you're a woman. If you are female, try boots designed especially for women. Women's calves are shaped differently from men's ï¿½ they are shorter, larger and lower on the leg. Women's boots are designed with cuffs that accommodate these differences. Women also tend to have narrower heels than men and manufacturers generally take this into account as well. 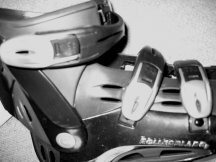 If you haven't inline skated before, you will be surprised and dismayed to find the brake on an inline skate is located on the heel of the right skate. This is a huge change for the toe stopper you remember from roller skates. The brake is made of rubber and the skater stops by a series of steps which ends with the lifting of the right toe, and dragging the rubber brake on the pavement while adding pressure. It is suggested that you learn how to brake properly, and the best way to learn is by taking a lesson from a certified instructor. ABT ( Advanced Braking Technology) brakes have been developed to assist the beginning skater in stopping. The skater scissors the braking foot forward. The pressure of your calf against the boot cuff when you scissor, pushes a rod attached to the cuff; which pushes the brake pad down. This is great for the new skater. But once the brake pad wears down, the skater must scissor farther and farther forward for the brake to work properly. So again it is suggested you take a braking lesson from an instructor to learn the proper technique. The frame attaches the wheels to the boot. The frames can be made of plastic or metal. Metal frames can be made of all sorts of materials, from aluminum to titanium alloys. The different metals are used to help build a strong yet light frame. The quality of the skate will assure that the frame is light, strong and rigid, properly aligned and attached securely to the boot. These all very important factors to consider when choosing your skate. If a frame is too flexible it disburses the energy of the stroke and results in poor performance and frustration for the skater. Check the frame of your skate for rockering ability. Can you adjust the spacers to allow for different wheel positions? Does the frame allow for larger or smaller size wheels? As you progress in your skating skill you will want to (and need to) purchase new wheels, at that time you will consider making changes according to your skating needs. Just be sure you pick a pair of skates that offers you the flexibility to use once you have gone on beyond the beginning phase of skating. Some skates also have the option of detaching the frame and realigning it on the boot, which is great for individuals with *pronation or *supination.. Depending on where you live you can have a variety of options when you are ready to go buy your skates. Quality inline skates are sold by a variety of retailers but are always easy to find. Inline specialty stores usually have a wide selection of brands, models and sizes. Depending on where you live, specialty stores will often double as a Ski shop in the winter. So you may not find a huge selection in the off season. The upside is that they usually have very knowledgeable staff to answer your questions and usually they have a service department for help with maintenance issues. Large sporting goods chains: are also likely to have a good selection and frequently have helpful sales people. Department Stores: usually carry less expensive brands and will not usually have inline skate sales people. Online Stores are a great option for people that don't have specialty stores in their area. It is important to know your size and what fits you well since you won't be able to try them on before you buy them. Check their return policy and educate yourself well before shopping online. EBay is an excellent place to purchase a variety of skates at great prices. Again it is important to know your size and what fits you well, since you won't be able to they them on before you buy them. Check their return policy and educate yourself well before shopping online. Note about shopping online: Visit skate shops in your area, or when you are traveling and try on many sizes and brands, write down what you like, what fits properly and costs. Make note of the mondo point of the brand and model you like. (Mondo point size may vary from brand to brand) Then shop online!! Shop wisely, compare your choices from store to store, and check online stores and EBay. You don't have to buy this years latest and greatest to get an excellent quality skate. Ask to see last years models, they are usually on close out for half the cost, but not on display. In most cases, the more you pay, the better quality the skate. An average cost for a good pair of recreational skates should be between $125-$200. For this cost you should get a good quality skate that will grow with you. The $125-$200 skates will be a much better quality then the $50.00 pair, (except when purchasing a previous year model.) More expensive skates, over $200 don't mean you are getting a better quality, you are getting more features, and higher end wheels and bearings or purchasing a specialty skate. If that is what you want from a new pair of skates go ahead and spend the money. Otherwise you can be quite happy with the less expensive pair. You can always upgrade your skates, by adding better wheels or higher quality bearings when it's time to change them out at a later date.